Fantastic news from The NODA North West District 1 awards night in Manchester last night. 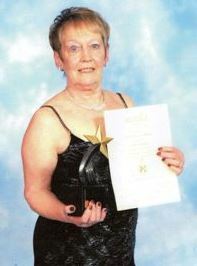 Carol Ackers won the B est Actress award for her fantastic portrayal of “Annie” in Calendar Girls. Carol’s award will now go forward to the area awards in Blackpool in May. Stoppress!! It is now May and Carol WON the regional finals in the “best actress” category! Many, congratulations to Carol and our Calendar Girls Director – Sue Mooney. Many congratulations to Carol and to all who took part in this wonderful production.